A little bit of everything. And then some. Well, I’ve gone and let weeks go by without any proper updates. Nothing much has happened that would pass for exciting, so I guess I don’t feel too bad. The Oasis is looking lush and tropical. 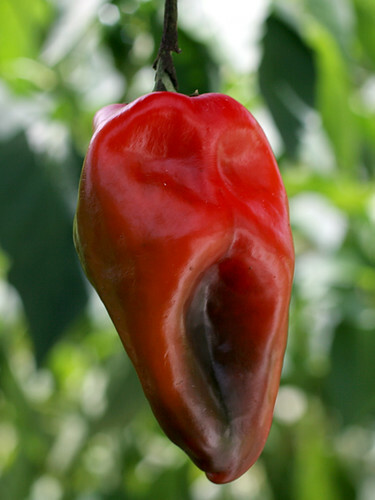 Screamy the Pepper has ripened. AJ thinks I could sell him as a Michael Jackson likeness on ebay. I’m letting him dry above my desk to see what he looks like when old and wrinkled. This is “Feisty” the Cuban Anole. How these miniature dinosaur replicas have escaped extinction is beyond me; because they are none too bright. 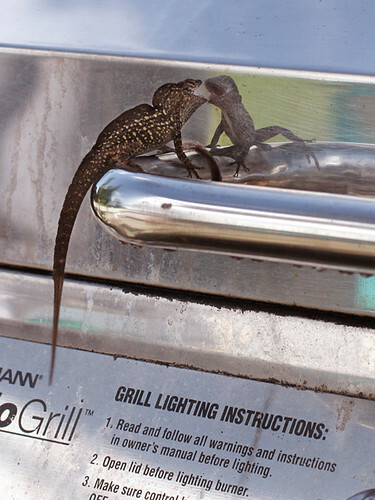 Every day, without fail, he takes his post on the grill lid handle, puffs up his crests and struts back and forth in an attempt to intimidate his perfectly matched opponent. Every day, he gives his best fight, only to be equaled by the foe with the steely bites (which leave both of their noses battered and raw). Neither will relinquish their territory in this daily ritual. 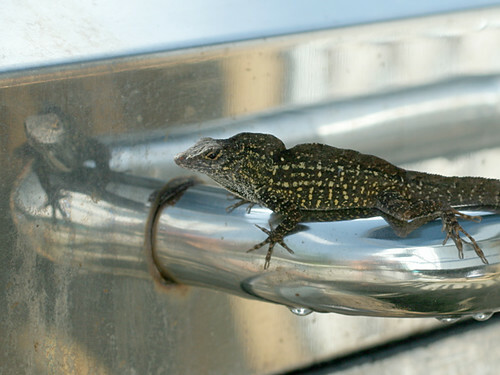 This is one neurotic lizard! Talk about neurosis. 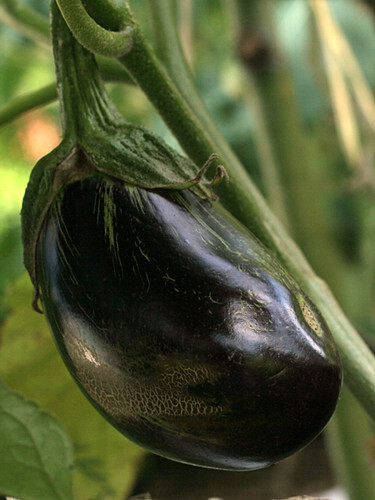 I got a little obsessed with this eggplant. As it grew larger and more regal, I began to get paranoid about its well being. 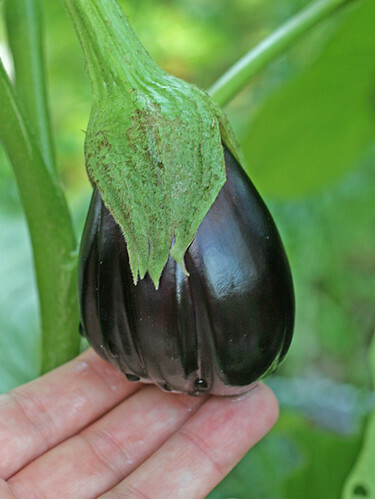 My research warned that eggplants lose their goodness once they get too ripe. They grow tough and seedy. They are meant to be picked while young and shiny. 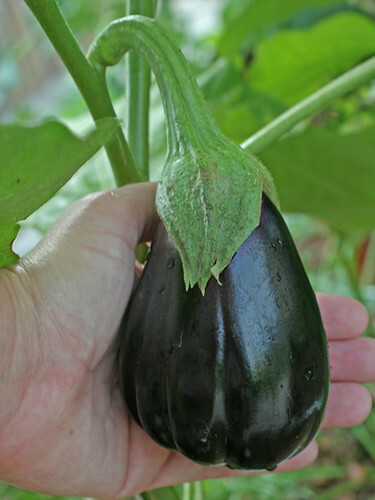 This is the first eggplant I have ever grown, and with all of the dangers of over-ripeness, insects and critters I gave in and picked it. AJ chastised me, saying that they were meant to be much larger before harvesting. 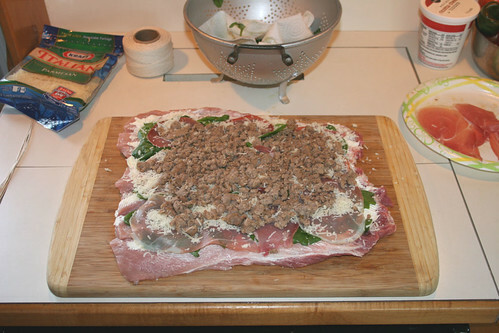 I sliced it up to find firm, seedless meat. 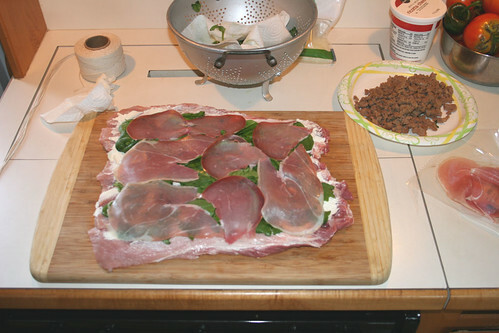 I marinated in Olive Oil and Balsamic Vinegar with fresh chopped garden herbs. Then I grilled to perfection. Captain Kym came over for dinner. 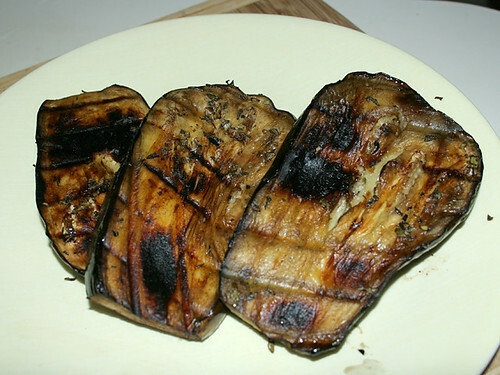 This is when I realized that eggplant (especially my version) is not for everyone. 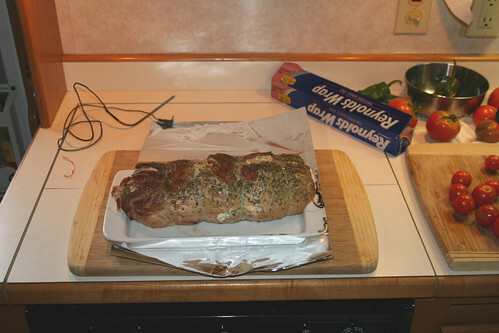 AJ and Kym politely nibbled on the vegetable, while we all devoured AJ’s roasted, stuffed pork tenderloin. 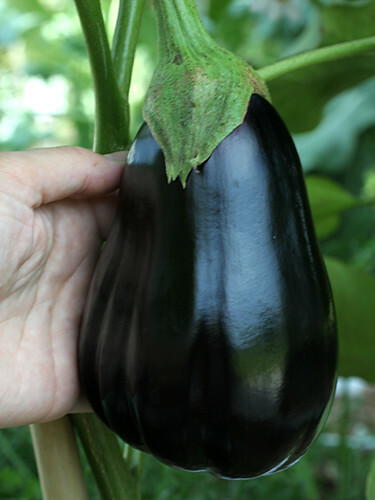 Oh well, I thought the eggplant was good. 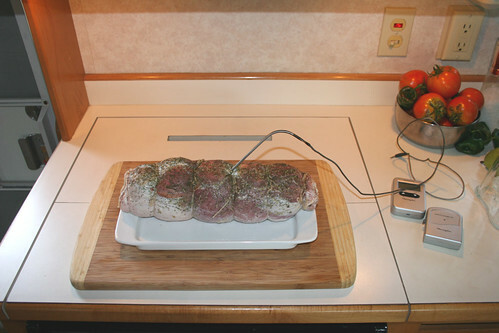 AJ’s pork tenderloin was delicious. 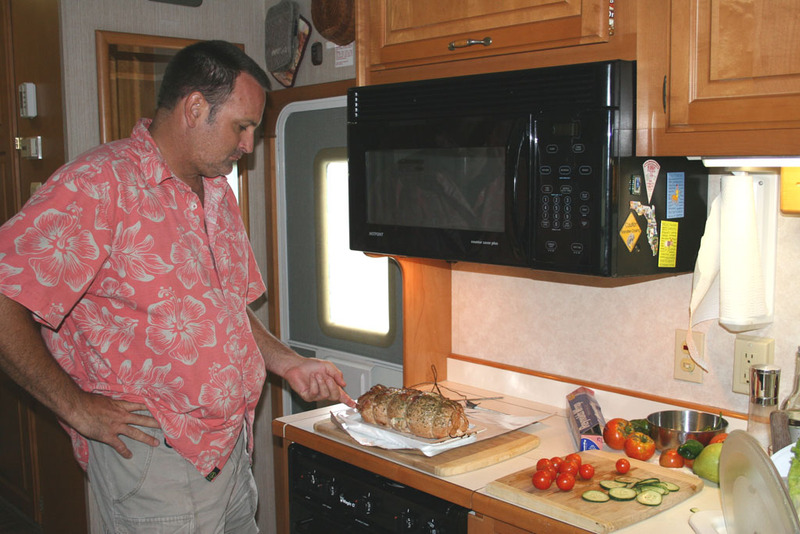 However, just as in everything he does, he immediately criticised his recipe and began planning for the improved version. 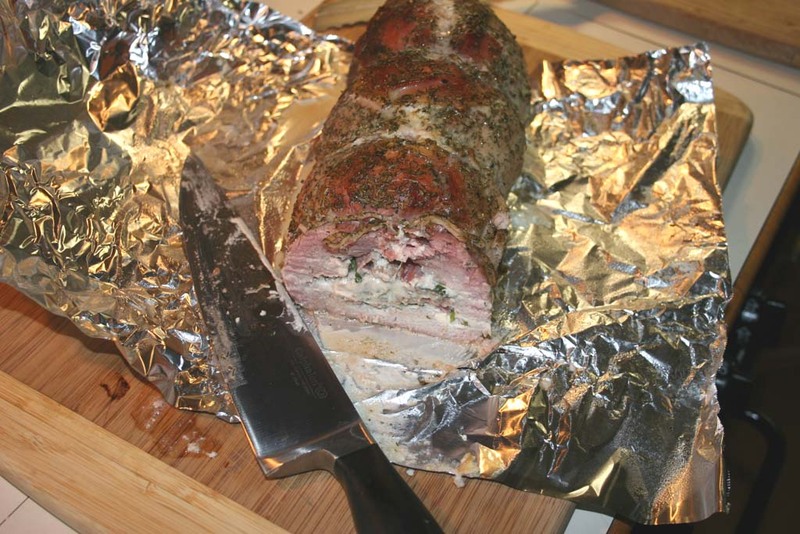 We still had half of the large cut in the freezer, so a few days later he set about perfecting his stuffed, smoked pork tenderloin technique. 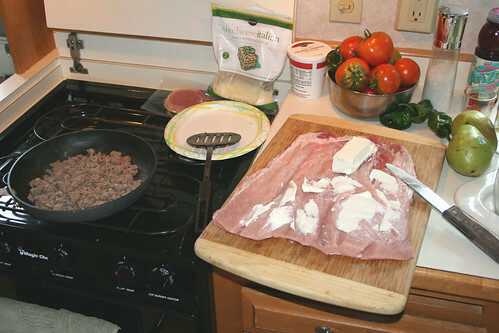 Butterfly tenderloin lengthwise to flatten. 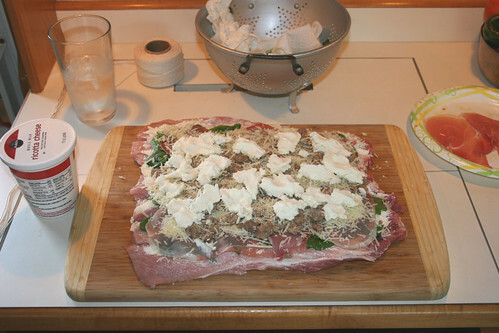 Spread Cream Cheese as bottom layer. Roll up and tie with cotton string. Season with Rosemary, Dill and Ken’s Greek Salad Dressing. 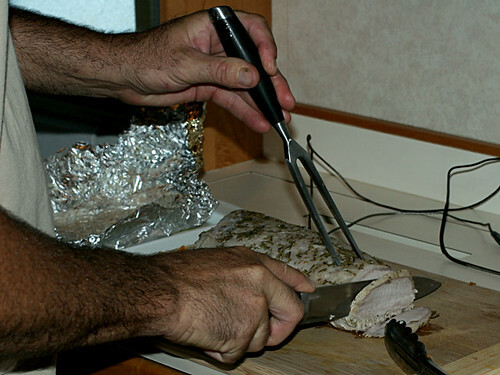 Remove from heat, wrap in foil and let rest for 10 minutes. The mystery guest’s children overran the garden, eating up all of the dill and most of the parsley. I moved at least ten ravenous caterpillars to the carrots, where they quickly matured and went on “walkabout”, looking for places to pupate. This one chose a green onion. Hope the wind doesn’t blow too hard. How’s this for camouflage? 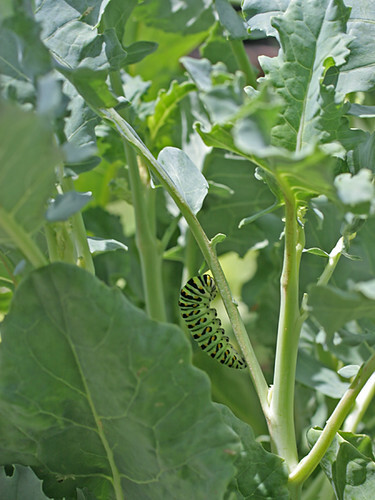 I found this fellow on the broccoli. 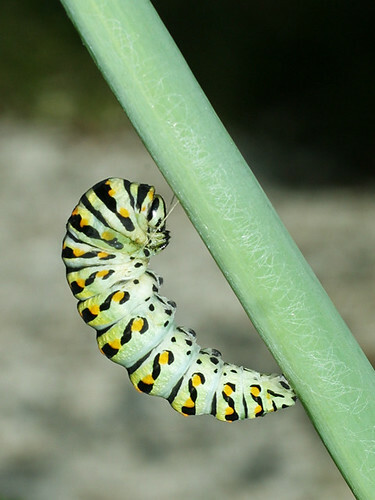 The next day was a perfectly hidden chrysalis that I would have never seen had I not known where to look. I have been aching to try broccoli greens, and carefully harvested the most tender leaves, while taking care not to disturb the sleeping beauty. 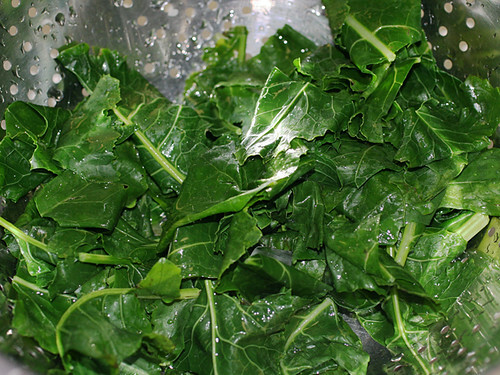 Harvest a bundle of tender Broccoli and/or Collard Greens. 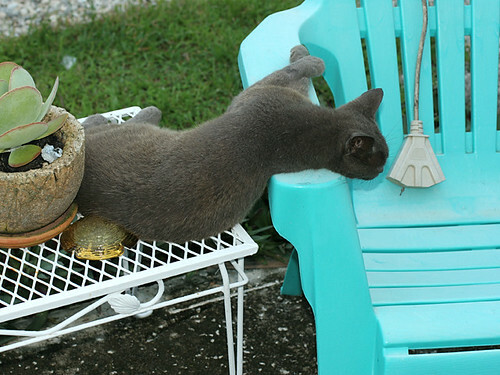 Wash thoroughly, taking care to remove all insects and insect eggs. 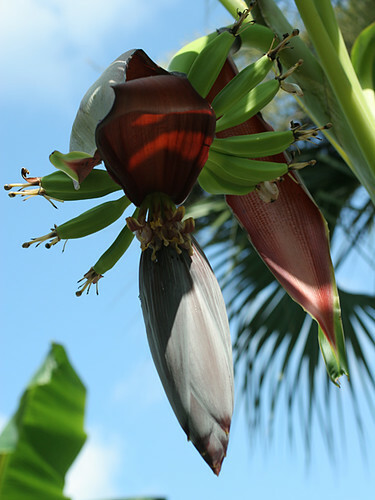 Cut into medium-sized pieces, removing central vein from larger leaves. Blanch by submerging greens in boiling, salted water just long enough to tenderize, and then plunging into ice water. This preserves the bright green color. 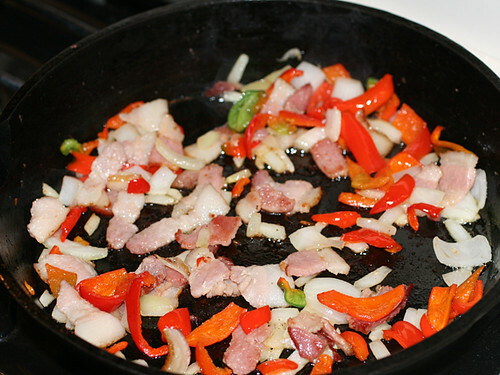 Chop bacon, onions and peppers (I used a red pepper and Poblano from the garden). 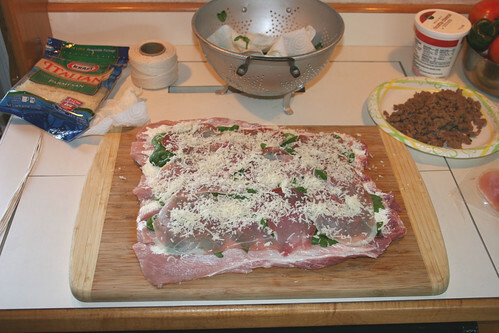 Once the bacon is almost cooked, add pressed or chopped garlic. 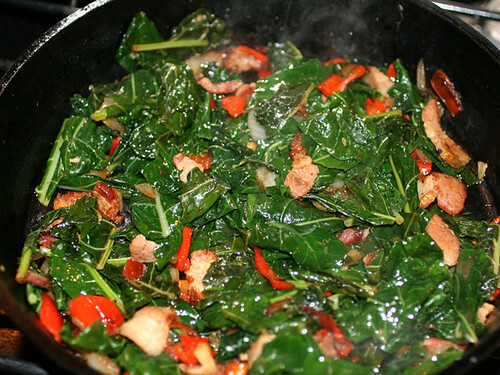 When bacon is cooked and onions are tender, toss in blanched greens. Drench with white wine, cover and simmer until greens are thoroughly wilted. AJ, who had previously stated his reluctance to try broccoli greens, enthusiastically ate his portion and raved about how good they were. 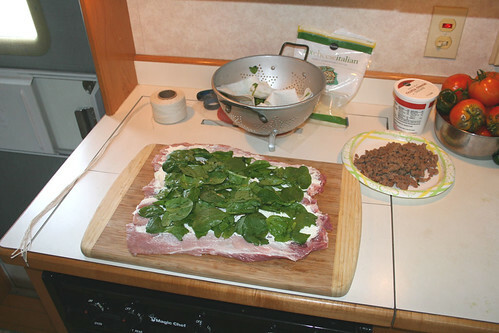 We enjoyed this dish as complement to his scrumptious smoked chicken. All in all, a week of good, down-home cooking. 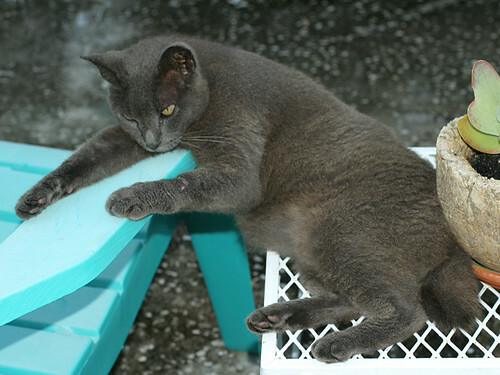 And as if on cue, Smokey the Silly Cat has found yet another way to chill while looking ridiculously uncomfortable. Hope everyone is enjoying life with peace and happiness! See y’all soon. Lots of goodies coming from the garden and the Universe over the past couple of weeks. 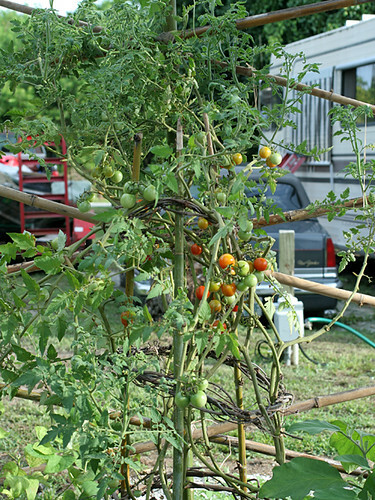 The tomatoes are still on full bore. I’ve been picking an average of ten to fifteen per day. 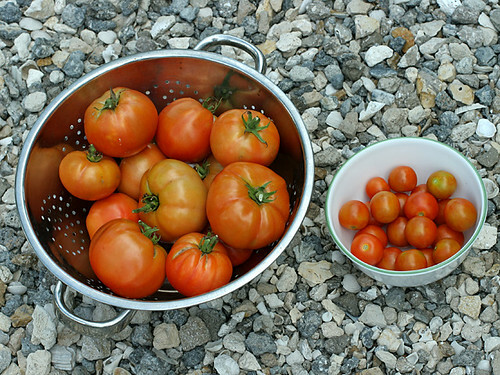 Here are a couple of harvests. This is not nearly everything I gathered over the past two weeks, just two of the bigger days. 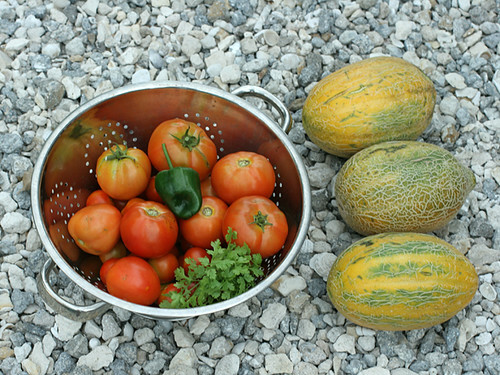 I collected the muskmelons because the vine was mostly dead. They could have ripened a few more days, but they were OK. The middle melon is the one I did not protect with the pantyhose. In retrospect I don’t see the value of doing this. The skin was thin and split on the protected melons, and the netting did not develop normally. I made salsa for the first time. 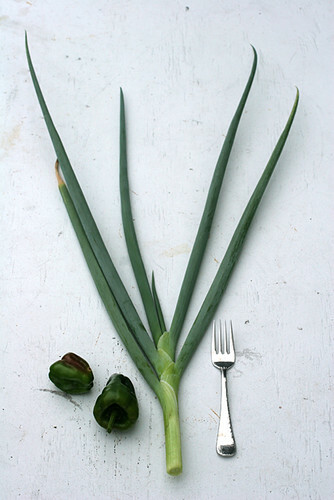 I didn’t realize how large the green onions were getting until I cut this one! These were store onions that I just stuck in the ground. They grow back each time I cut them. I also picked a puny red pepper and a smallish Poblano. The salsa is still a work in progress. and grew! Since I’m not familiar with what these are supposed to look like, I am not sure when to pick it. I’m thinking I’ll pick it this weekend, since the consequences of waiting too long seem to outweigh the risk of picking too soon. 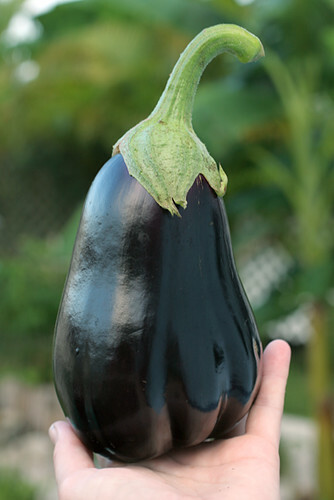 Here is Super Eggplant’s sidekick. I don’t know why it looks so different, but I think a bug got ahold of it. The second batch of bananas is looking good. First batch is also coming along nicely, too. They sure are taking a long time, though. 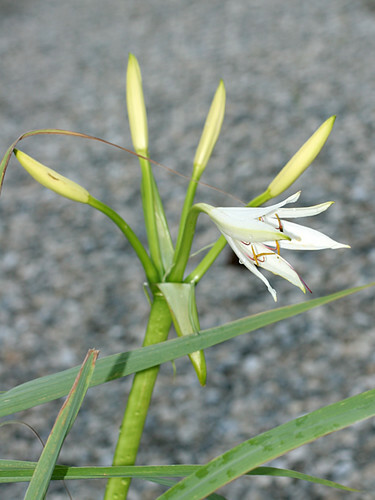 This is the string lily AJ brought back from the river. We keep it in a container under the AC condensation drip. It is going great, and bloomed this week. 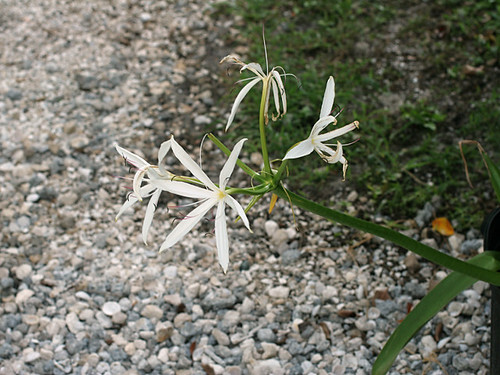 The blooms were short-lived, but very delicate and pretty. I can’t say my husband doesn’t bring me flowers! The kind he brings are much more interesting and thoughtful than those bought in a store. Not only that, but he can smoke a mean pork tenderloin! Yum! Yesterday was a special treat. We stopped in at John Roger’s to pick up some bamboo. John is a local horticultural guru and, as I’ve said before, one of the most knowledgeable and unassuming guys you could ever hope to meet. Even though he was on his way to run errands he took the time to give us another tour of his property to show us some of the things he has growing, as well as some nice mounds of mulch and compost. Had you told me, a year ago, that I’d get a thrill from compost I would have looked at you askance! Nor did I even know of heirloom and heritage varieties, about which I am now quite excited. 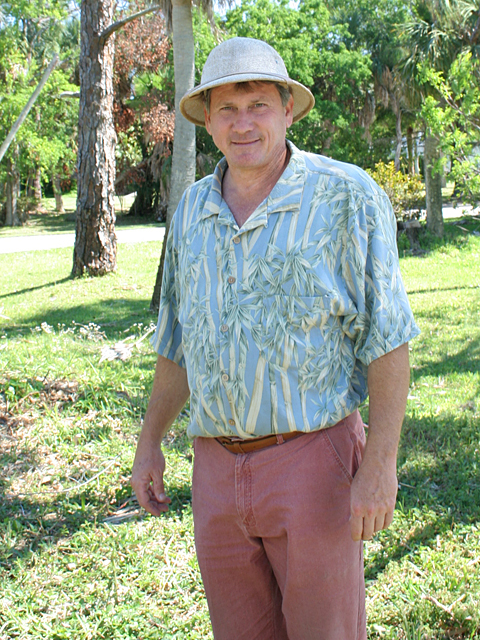 John Rogers is a true steward of the land and cultivator of native and unique plant varieties. As we headed to the compost heap we stopped to admire his massive watermelon and squash vines. He promptly plucked this little jewel and bequeathed it upon me. What’s the big deal? 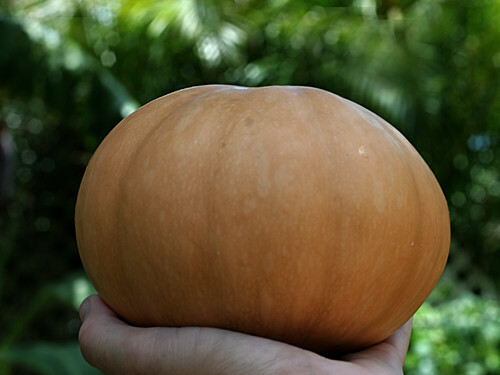 This is a renowned, historic gem of the squash persuasion: A Seminole Pumpkin Squash (Cucurbita moschata), to be exact. At the recent Funky Chicken Farm seed swap, John Rogers encouraged me to get some Seminole Pumpkin Squash seeds. I had never heard of this variety, but have since learned that it is a true heirloom, indeed developed by the Seminole Indians. 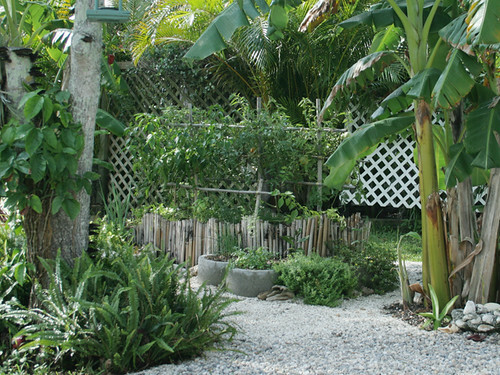 They planted these hardy, natives at the base of palm trees, and allowed the vines to grow up the trunk and fronds. Considering how robust the plants seem to be, I imagine that this was quite a sight! Wish I had brought my camera to John’s place! 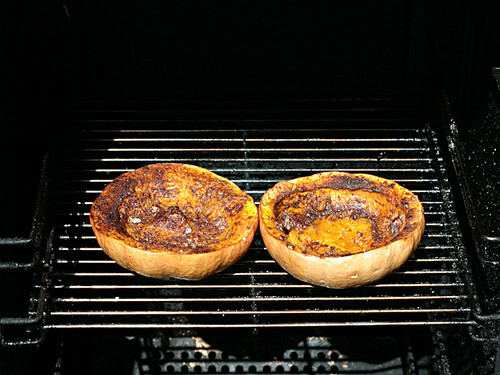 I cooked the squash in the smoker, using my father’s recipe for acorn squash: A chunk of butter, a sprinkling of brown (raw) sugar, cinnamon and nutmeg. It looked beautiful, and tasted much like sweet potatoes. AJ, didn’t take to it, since he is not much for sweet food. Strange for the guy who can devour ice cream and candy bars like they are going out of style, and who is currently drinking a Pina Colada! Oh well. I’ve got some seeds and will be planting Seminole Pumpkin Squash this weekend. Here they are in the smoker, which was still hot from the pork tenderloin. 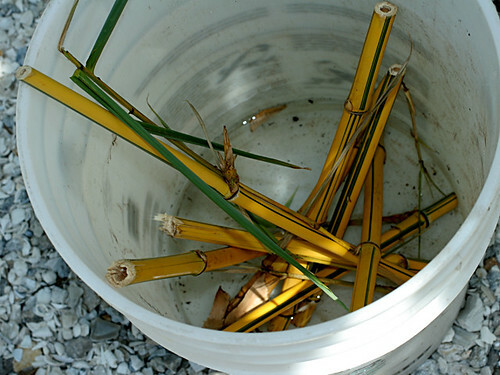 The original reason for going to John Roger’s (AKA Bamboo John) was to pick up a cutting of the lovely striped bamboo (Bambusa Vulgaris), which I managed to kill last time. I think we will get it right this go round , and hope to have a stand going soon. Thanks again, John! So far, a good two weeks. I will try to get the wrap-up posted on Sunday evening. I Tweet the searches that brought you here.